↑ 1.0 1.1 "Colorado River". Geographic Names Information System. United States Geological Survey. 1980-02-08. Retrieved 2012-02-18. ↑ 2.0 2.1 Kammerer, J.C. "Largest Rivers in the United States". U.S. Geological Survey. Retrieved 2010-07-02. 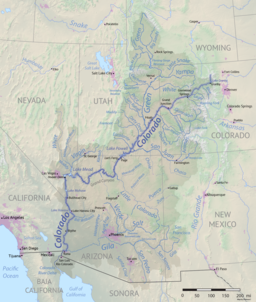 ↑ "Colorado River Watershed" (PDF). Arizona Department of Water Resources. Retrieved 2012-04-27. ↑ "Bill Williams Watershed" (PDF). Arizona Department of Water Resources. Retrieved 2012-04-27. ↑ Hoover Dam 75th Anniversary History Symposium 2010, p. 102. ↑ "USGS Gage #09424000 on the Colorado River near Topock, AZ – Daily Data". National Water Information System. U.S. Geological Survey. 1935-02-14. Retrieved 2012-04-21.